I spent sometime getting acquainted with the new sander today. Added some more photos too. Looking good. One question/comment though. It looks like you haven’t glassed the hull’s outside at all, since you’re building the boat in a cradle from step one. How and when do you plan to glass the hull? Good question OzzyC. Sometime next spring comes the “flip”. First she’ll go on her side to attach the keel, then upside down to glass the outside. 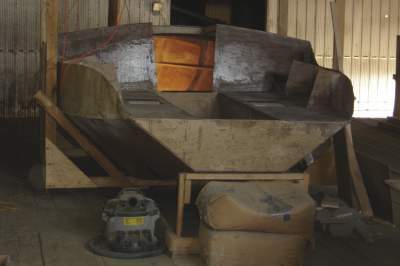 Kind of a reverse of the process for building a boat like the GT23. We took a couple of weeks off, but hit a minor milestone last night, when we laid our first tape seams. That’s a good point. I’ve thought about glassing the underside but think I’d prefer the plywood route (provided the added weight is within “tolerance”). What a sweet boat, I am wanting to start the same project come next fall. I have about a million questions, but wil keep it to just a few. How long have you been working on her? What type of sailing are you planning on doing? What made you choose the VG23? I just got into boat building last year built a little 10′ dingy and I am just dying to get into a bigger boat and go cruisin’ the local pacific. Hope to hear from ya and looking forward to see her progress. P.S. Have you got a name for her? I haven’t really been keeping track of hours or even days but I can tell you I’ve been building for the past two summers. As for why the VG23… Keep in mind I’m not an experienced sailor; what I like about the design is the versatily – trailering should be fairly straightforward and she’ll have the ability to do some extended cruising. I live in Montreal so expect to spend a fair bit of time on the St. Lawrence. The building method appealed to me as well – while I had absolutely no boat building or fibreglass experience I felt this was something I could do without making a complete disaster of things (still needs to be confirmed ;-). Here’s my email – alucking_AT_gmail.com – keep me infomed as your build progresses or if I can help with some of your other questions. Looking good. Every time I see someone else making progress on their project, it makes me want to play hookie and work on the boat. Sorry to say you won’t be getting much inspiration from my build for the next while. I “cocconed” the vg23 in plastic a few weeks ago and we’re sitting at -10C in Montreal today. The houseboat is looking good. Glad to hear the glassing on her hull worked out. Greg deserves a pint for his heatgun stroke of genius ;-) (One of these days I’m gonna to get a blogger account so I can drop a comment on your blog).